For Millennials, Is Job-Hopping Inevitable? It's fair to say that many millennials are job-hoppers. Six in 10 members of this generation say they're open to different job opportunities; only one in two plan to be with their company one year from now; and 50% say they'd consider taking a job with a different company for a raise of 20% or less, according to Gallup's report How Millennials Want to Work and Live. Job-hopping among millennials (born between 1980 and 1996) is problematic because these workers currently make up 38% of the U.S. workforce; some estimate that they will make up as much as 75% of it by 2025. This job-hopping reality is harsh, but leaders should not accept it as the new norm. Not all millennials are prone to leave, and their engagement at work is at the heart of the issue. Millennials who are engaged at work are 26% less likely than millennials who aren't engaged to say they would consider taking a job with a different company for a raise of 20% or less. Engaged millennials are also 64% less likely than actively disengaged millennials to say they will switch jobs if the job market improves in the next 12 months. In other words, engaged millennials demonstrate greater loyalty to their employers -- and millennials who are either not engaged or actively disengaged are giving the entire generation a bad name for bouncing from job to job. Emphasize work-life balance. Millennials are all about work and life. Nearly six in 10 (57%) millennials say work-life balance and personal well-being in a job are "very important" to them. Unfortunately, only 29% of millennials strongly agree that they feel comfortable discussing life outside of work with their manager. This is a major problem because millennials who feel they can talk with their manager about nonwork-related issues are far more likely to stick around, with 62% planning to be with their current organization for at least another year. Managers need to regularly communicate that they genuinely care about their employees. One way to show this is not to treat all team members the same way, but to connect with each team member personally. Great managers naturally practice this "soft" aspect of management, and this results in more engaged workers who want to stay. Bring purpose into focus. A deeply felt sense of purpose ties millennials to their jobs: 71% of millennials who strongly agree that they know what their organization stands for and what makes it different from its competitors say they plan to stay with their company for at least another year. Millennials want to understand how they fit in with their jobs, teams and companies. They want a job that fuels their sense of purpose and a manager who shows them how their efforts advance the company's mission. By meeting millennials' need for purpose, leaders and managers are more likely to retain these workers. Provide worthwhile opportunities to learn and grow. Opportunities to learn and grow are uniquely important for retaining millennials. 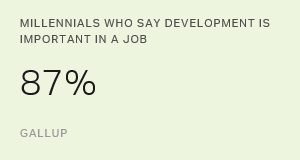 Close to nine in 10 millennials (87%) rate professional or career growth and development opportunities as important to them in a job, and 68% of millennials who strongly agree they have had opportunities at work to learn and grow in the past year plan to be with their organization for at least another year. Unfortunately, companies are struggling with this vital retention driver: Only 39% of millennials strongly agree that they learned something new on the job in the past 30 days, and fewer than one in two strongly agree they have had opportunities at work to learn and grow within the past year. Even among millennials who have had opportunities to learn and grow, only one in three strongly agree that their most recent learning opportunity at work was well worth their time. Managers need to be approachable. A staggering 93% of millennials say that the last time they changed roles, they left their employer to do so. One contributing factor may be that millennials do not feel comfortable approaching their managers when they desire progress or something new -- for example, opportunities for more work responsibilities. Rather than resolve these issues with their managers, millennials may instead explore other job opportunities that offer these experiences. Managers should proactively lead conversations with employees about their future with the company, their needs and their opportunities for advancement. Millennials think about their job as a steppingstone and want to progress -- but they may need their managers' help to visualize their future trajectory within the company. By emphasizing millennials' potential for advancement, managers communicate that workers don't need to go elsewhere for more. Gallup data show that at least 70% of the variance in employee engagement scores is attributable to the manager alone. Millennials are no exception to this rule -- and it is leaders' and managers' responsibility to provide engaging coaching to retain top talent. When it comes to stopping millennials from leaving, great management goes a long way. Engaging millennial employees dramatically decreases the likelihood that they will change companies.